October 29, 2013 , Auburn Hills, Mich. - Chrysler Group LLC is preparing to head west with a Mopar-customized contingent of creations along for the ride. At the 2013 Specialty Equipment Market Association (SEMA) Show in Las Vegas, Nov. 5-8, 20 vehicles customized with existing Mopar parts and accessories, as well as concept products designed to elicit feedback, will take the spotlight in the 15,300 square-foot Mopar display at the Las Vegas Convention Center. Mopar-modified vehicles from Chrysler, Jeep®, Dodge, Ram, SRT, and FIAT brands will be prominently featured at the premier aftermarket event. "The SEMA season is our favorite time of the year," said Pietro Gorlier, President and CEO of Mopar, Chrysler Group LLC's service, parts and customer-care brand. "It's a chance for us to flex our creative muscles and showcase our vast portfolio of proven, quality-tested performance parts and accessories." When Ram isn't hard at work, it's back to the beach with the Ram Sun Chaser show truck. Vibrance Orange Blast, with two-tone Brilliant Black paint, color this Ram 1500 Quad Cab. 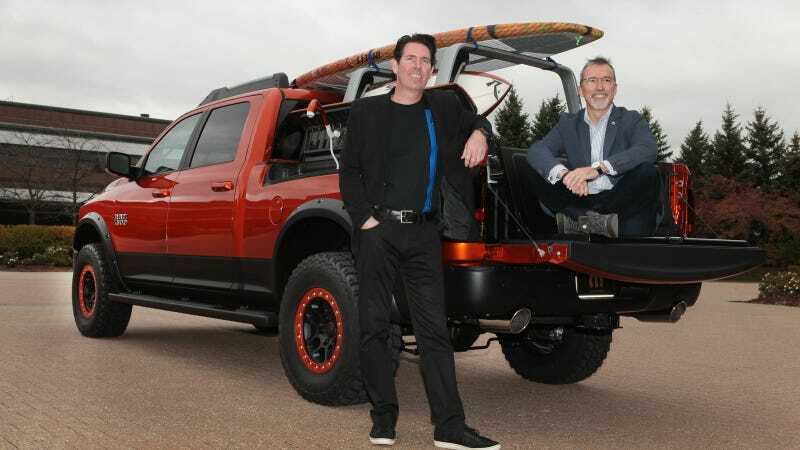 A unique concept Mopar roof rack, dubbed the "surf rack," and two adjustable support rails housed within the tracks of the truck's bed, accommodate a long surfboard. As an added bonus, hooks on the side of the rails can also carry up to four boards. To wash off salt water or seaweed, Ram Sun Chaser's exclusive RamBox bed-side storage features a concept water tank equipped with a hose and a portable shower head, forming a makeshift shower kit that may be clipped on to the rack for a quick rinse. A bed step enables easy access to gear. Surfers or paddle boarders can take a seat when taking off gear or waxing their board with the concept "Flip-Up" seatback tailgate, which converts into a bench by folding back toward the cab of the truck. New concept 17 x 8-inch beadlock wheels with color-keyed rings, concept flares with exposed fasteners and modified black tubular side-step rails fit the sand dune-ready theme of the vehicle. Orange tow hooks, a satin badge, and a spray-on bedliner are also added by Mopar. Going to the next level of customization, the Mopar-modified Jeep Cherokee uses the Trailhawk 4x4 package powered by a 3.2-liter V-6 engine as a starting point. Its exterior is colored in Auburn Pearl paint, with low-gloss black and Granite Crystal with low-gloss clear touches. Other Mopar goodies include bright door-sill guards with the Jeep Cherokee logo, a wireless smartphone charger, and WiFi. The Jeep Cargo Management Receiver System (JCMRS), a unique option that features a running bar along the left interior, to which Mopar items may be mounted, is also utilized. The Mopar roadside emergency kit, Trailhawk bag and first-aid kit are mounted to the JCMRS. In the Jeep Performance Parts department, a Mopar cold-air intake and a cat-back exhaust are put to work to achieve horsepower gains. The iconic and elegant Chrysler 300 is elevated even further to reach the ultimate in style and street cred with a variety of Mopar appointments utilized to create the 2014 Chrysler 300S for the SEMA Show. Phantom Black Tri-coat colors the exterior, maintaining the elegance of the Chrysler 300S, while adding a menacing edge. Fitting its gritty, big-city vibe, the front is reinforced by a 13-bar black "Gotham" grille surround, with a lowering kit, dropping the 2014 Chrysler 300S closer to the streets. The wheels pull from the Chrysler 300C John Varvatos Limited Edition with 20 x 8-inch wheels finished in a Mopar bronze, accented with Mopar wheel center caps. A black SRT spoiler embellishes the tail and helps drive the rear towards the pavement when in motion, enabling the 300S to corner urban canyons with impressive agility. Luxurious touches rule the interior, with seats and door bolster inserts wrapped in Katzkin "Bisque" leather. Leather seatbacks are embossed with the "Imported From Detroit" logo, and matching Katzkin "Bisque" threads border the seats, door and console armrests. All bright trim is changed to Satin Black, and the Mopar Lite Bronze found on the wheels is also featured in the trim accents. Mopar news and images, as well as a link to the livestream broadcast from the Mopar display area at SEMA on Tuesday, Nov. 5, are available on the brand's website at mopar.com/sema. Mopar is Chrysler Group LLC's service, parts and customer-care brand and distributes 280,000 parts and accessories. With the creation of the industrial alliance between Chrysler Group and FIAT SpA, Mopar is extending its global reach, integrating service, parts and customer-care operations in order to enhance dealer and customer support worldwide. Mopar's global portfolio includes more than 500,000 parts and accessories that are distributed in more than 130 markets. Mopar is the source for genuine parts and accessories for Chrysler Group brands as well as FIAT brands. Mopar parts are unique in that they are engineered with the same teams that create factory-authorized vehicle specifications for Chrysler Group and FIAT vehicles – a direct connection that no other aftermarket parts company can provide. A complete list of Mopar accessories and performance parts is available atwww.mopar.com. Mopar (a simple contraction of the words Motor and PARts) was trademarked for antifreeze product in 1937. The Mopar brand made its mark in the 1960s – the muscle-car era. The former Chrysler Corporation built race-ready Dodge and Plymouth "package cars" equipped with special high-performance parts. Mopar carried a line of "special parts" for super-stock drag racers and developed its racing parts division called Mopar Performance Parts to enhance speed and handling for both road and racing use. The brand has expanded to include technical service and customer support.